Total Vein Care is Northern Colorado’s only vein care center dedicated exclusively to the treatment of vein disease. Chronic venous insufficiency is a progressive condition that leads to leg pain, spider veins, varicose veins, leg swelling, and skin damage and skin ulceration. Total Vein Care uses state-of-the-art technology in treating both the medical and cosmetic aspects of vein disease, resulting in minimal recovery time and excellent long-term results. ​How serious is vein disease? Deep venous thrombosis is a very serious problem, resulting in significant mortality, especially when associated with pulmonary embolism. When valves in the deep veins are destroyed by a clot, they produce essentially the same progression as is seen in chronic venous insufficiency, leading to potentially debilitating leg swelling and even skin ulcers. The care of the skin damage comes at great expense and missed work days. While the earlier stages of chronic venous insufficiency, including varicose veins, are less serious, when their underlying cause is treated at Total Vein Care in Fort Collins, more serious problems can be averted. ​Chronic venous insufficiency (CVI), or chronic venous disease (CVD) as it sometimes called, refers to symptomatic vein disease, producing varicose veins, swelling, skin problems, and, ultimately, skin ulceration. This definition does not include acute problems such as blood clots, obstructed veins, and injuries. The function of the leg veins is to return blood, depleted of oxygen after passage through the muscles, to the heart. This requires an independent mechanism, separate from the heart itself, to pump blood back to the heart against gravity, while a person is standing. In a healthy vein, valves do not permit reversal of flow and, when they close, the blood is prevented from flowing toward the feet. In a diseased vein, abnormalities in these valves in all three types of veins do permit blood to flow in reverse and thereby interfere with the function of the calf muscle pump. The calf pump can generate pressures of 200 mmHg during contraction of the muscles, propelling blood toward the heart. During relaxation of the calf muscles, competent valves close, preventing reversal of flow, or reflux. With normally functioning valves, a single contraction of the calf muscles can pump up to 70% of the blood in the legs toward the heart. The resting pressure in the veins is approximately 100 mmHg. After ten contractions of the calf muscles, pressure is reduced to between 20 and 30 mmHg. Incompetent valves or blockages in the veins prevent the reduction of pressure to a normal level. The inability to lower the venous pressure to a normal level during exercise is called ambulatory venous hypertension and this condition is responsible for the pain, varicose veins, swelling, and skin problems that occur in chronic venous insufficiency. What causes the valves in the veins to fail, leading to backward flow? In the superficial veins, valves usually fail because of a defect in the vein wall, leading to the vein dilating with the pressure produced by the blood during standing. At a certain point, the leaflets of the valve can no longer touch and valve function is lost. As the series of valves in a superficial vein become incompetent, reverse flow of the blood can be unimpeded from the heart to the foot. This produces ambulatory venous hypertension. The inability of the calf muscle pump to lower pressures in the veins to normal levels leads to the problems described above. Incompetent valves in the deep veins usually occur when a blood clot, or thrombus, damages the valves directly. In the larger deep veins, closer to the heart, valve damage from a clot can be reduced if the clot is removed early, using a special type of catheter. Especially in the deep veins, blockage of blood from returning to the heart by a deep venous thrombosis (DVT) can lead to elevated pressures in the veins in the lower leg. Almost 80% of the patient’s seen at TVC for vein problems report a family history of the same. Although genetic factors are most important earlier in life, after the age of 50, advancing age is the major risk factor. It is been estimated that half the population older than age 50 has CVI. Chronic venous insufficiency is a progressive disease. 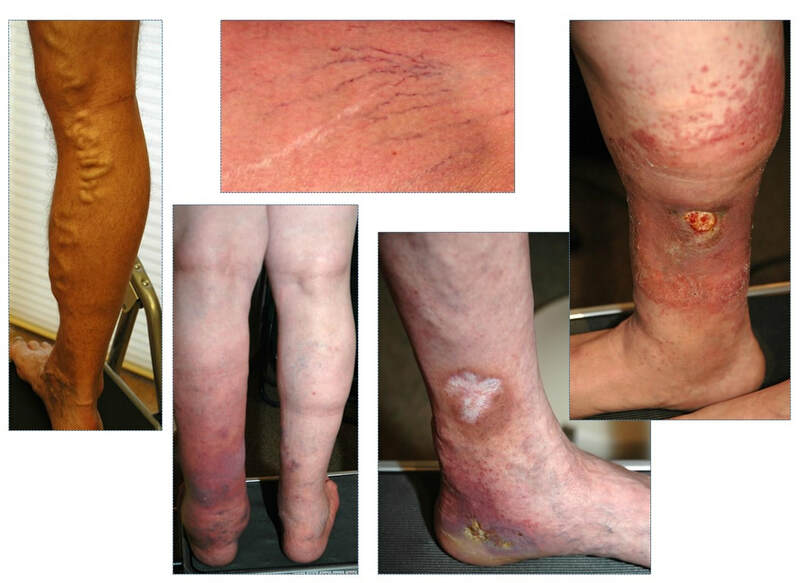 Examples of the various stages of chronic venous insufficiency.